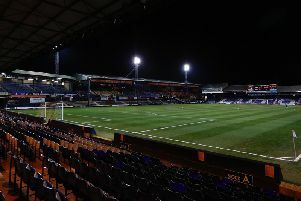 Hatters defender Luke Wilkinson has revealed he would love to still be at Kenilworth Road and never wanted to leave the club. The 25-year-old was a surprise departure from the club on Friday, heading to Stevenage after finding out he wasn’t going to be in new manager Nathan Jones’ plans. Speaking exclusively to the News/Gazette about his exit, Wilkinson said: “I loved every minute of my time there, and am gutted not to still be there, but I totally understand where they’re going. “I wasn’t in the team and I just thought I’m going to train and try to get back in the team. “I had a phone call on the Wednesday that my agent had spoken to the club, I wasn’t going to play as much as I would have liked and basically that Stevenage wanted me. The defender did appreciate the honesty shown by Town’s new boss though as he continued: “I spoke to the manager and he went through everything with me. “He said the team he’s picked to start with was a team he sort of knew because he didn’t know everyone at the club when he came in, which was totally fair enough and I totally understood where he was coming from. “That’s fair enough, that’s football for you. I totally understand where he’s coming from, he wants to put his own stamp on it, and I wish him all the best in that.